The Nordex Group is one of the leading integrated, global manufacturers of innovative onshore wind turbine systems. The Group, which also includes the Spanish subsidiary Acciona Windpower since April 2016, has installed wind power capacity of more than 23 GW in over 25 markets. In 2017 the Nordex Group generated sales of approx. EUR 3.1 billion with about 5,000 employees. The production network comprises plants for turbine assembly and rotor blade production in Germany, Spain, Brazil and India, the head office is located in Hamburg, Germany. Founded in 1985, Nordex has more than 30 years of industry experience. The product portfolio includes onshore wind turbines in the power range from 1.5 MW to 4.8 MW, addressing the requirements of developed as well as emerging markets. These wind turbines allow operators to produce environmentally friendly electricity at the lowest possible cost (Cost of Energy – COE) in their respective regions. The growing service business of the Nordex Group is servicing more than 6,800 wind turbines, with installed capacity of more than 16 GW. 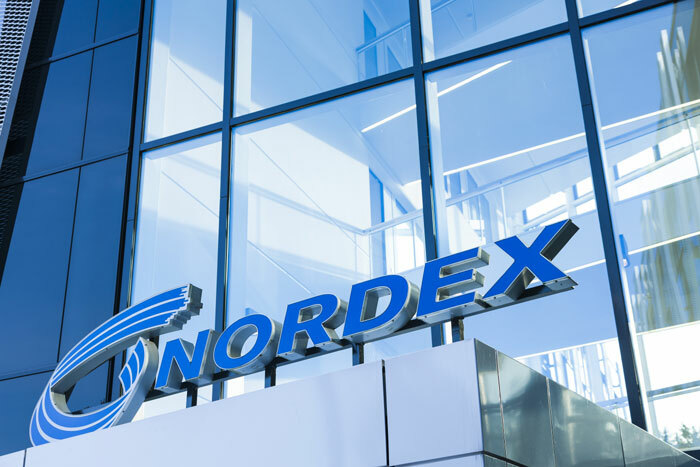 The publicly traded holding company Nordex SE (ISIN: DE000A0D6554) is listed in the Prime Standard of the Regulated Market of Deutsche Börse and is part of the German TecDAX index.